There is a currently a problem with the links. I hope to have it fixed soon. Looks like it’s up and running now. If you experience any issues please contact me. Virtually every week I hear someone say, “I am building a clone of a Fairchild 670, or Pultec EQP1, or [insert name of famous piece of gear here]. Clone is just a euphemism for copy. That doesn’t sound so creative, does it? Copying the Fairchild 670. Friends won’t be quite so impressed. No loud talk of making a copy while drinking sub-standard bourbon, in a bar in the trendy part of town. “Clone” sounds so high-tech. In another field — writing — the word would be “plagiarize.” The company is out of business or the person who designed it is dead? Doesn’t matter. Neitzsche is dead but if someone takes his words and calls them his own it’s plagiarism. If these cloners, these technological plagiarists, knew what they were doing they would not be copying. They would analyze the best of what has been accomplished so far and ask, How is this function best done today? The result would be something new, something superior. But to do this they would have to start from the ground up, learn, make mistakes, learn some more, understand­ — and that takes time. Ten thousand hours? Too long. They can copy someone in one one-hundredth of the time and then use it or sell it. In both cases they are profiting from someone else’s work. They plagiarize circuit details that now 20 to 50 years later can be done a better way. But that’s to be expected. And these forgers want to have all the mechanical parts — knobs, meters, dials, escutcheons — match the real thing, as if their clone, hewn on their kitchen table, is going to confuse anyone into thinking it’s the real thing. And almost every one of these counterfeiters thinks his is superior to all other clones because each claims “I am the only one who understands the circuit.” They understand very little. And where are the clones? About 40 years ago, I sold my National NC-33 receiver to my friend G. He used the radio for a while and then sold it to a person, who should remain nameless. When I asked G. how his customer was enjoying the radio, he told me that he wasn’t. The buyer decided he wanted to upgrade the internal appearance of this perfectly functioning piece of equipment. To this end, he removed every resistor, thinking that all resistors were of exactly the same function and rating. This in spite of the obvious physical differences, including color code and size. He also did not bother to record where each resistor was removed from. Something this stupid doesn’t happen often but people do often stop by Leeds with a big list of parts they want to buy to replace virtually every passive component, hoping that this will fix their non-functioning piece of gear. I have two important things to tell you about that. First: Replacing all the components is not troubleshooting. It’s stupid. People who want to do this have absolutely no idea how anything works. Secondly, replacing all the components increases the possibility of collateral damage. Vintage gear can be fragile and component removal in hard-wired chassis is difficult. The leads may have two or more wraps around the terminals they are on. Removing the solder and then unwrapping the leads while they still may be partially attached takes skill and patience. Want to fix something electronic? Baby step: Learn to read schematics. Learn every single symbol for every single component of the gear you are working on. If you can’t do this go back to texting your friends or watch some cartoons. Next step: Understand the circuit. It’s best if you start off knowing what every single component does. If that’s not possible you have to at least know exactly how each block works and what it does. If you can’t do this, you have very little chance of fixing the device. Next: Unless you are really familar with the piece you need documentation. 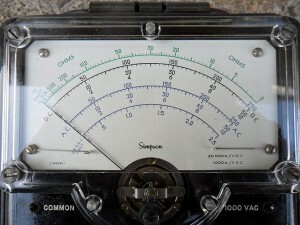 Schematic, manual, voltage chart, etc. Don’t have those and you’re not familiar with the piece of equipment? Then you have very little chance of fixing the device. Next: Fix the most obvious problems: burnt resistors, missing parts, damaged parts, and any safety-related issue. Also check that it has the correct fuse. You can then power it up and make some measurements. Unfortunately this means you still need knowledge and experience, especially if you don’t have documentation. Next: You powered the thing up and it still doesn’t work? You better have a scope. Don’t have one? Unless the thing is simple, it’s not going to be easy. If it is simple a DVM can work. 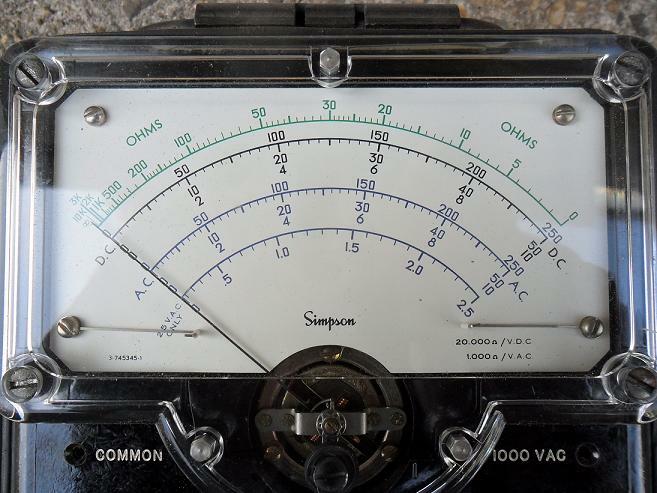 And whatever piece of test equipment you use, you better know how to use it. To learn all this takes time and patience. It’s the arrogance of the internet age that makes people think that they can do something without learning it first. I was once at a breakfast buffet where the chef at the omelette station could make two perfect omelettes, in two different pans at the same time. It was a ballet. I thought to myself that if I made two omelettes at a time every day for the next ten years that I couldn’t do that as well as he did. Nothing that matters is easy to learn. When you see people that make it look easy it’s because they are enjoying learning. Their gray matter, their motor skills, or strength is still working hard. If a tube falls in the forest, does it make a sound? I love reading the gushing descriptions about how tubes are supposed to sound. Really? I have more tubes than most people will have in 100 lifetimes and I have never heard a tube make any sound at all. Yes, I know what they are trying to say but they are misleading people with these descriptions of “how a tube sounds.” Talking about how a tube sounds outside of the context of a specific piece of equipment and system is a joke and that’s why some people who have chased a holy-grail tube are sometimes so disappointed. These descriptions can only do one of two things: disappoint or delude. So, if I put this in a 1961 Rheems phonograph with crystal cartridge and 4-pound tone arm, I will get very detailed sound? My favorite 12AX7 for use in my highly modified Conrad Johnson PV1 is the Telefunken smooth plate but I’ve heard plenty of pieces of equipment where that wouldn’t be the best choice. And tubes will not fix the sound of a poorly-designed piece of gear and won’t ruin the sound of a well-designed piece of gear. When everything is right selecting tubes puts the icing on the cake. Nothing more than that. People hate this because it means that the only way they can find out what works best is to try and try again. It also means that if you buy something that really isn’t good there’s not much hope. Reminds me of when I got a HK Citation I preamp about 20 years ago. What a miserable piece. So why all of these flowery descriptions? They make it easy to separate people from their money. They also make good fodder for online forums and guys who would rather talk gear than listen to music. You know those gear-hounds: they get out their Sheffield Drum Record, that copy of Dafos or play Dark Side of the Moon for the 3000th time. A quick check in Tube Test Conditions for Hickok Cardmatic Tube Testers, published by Hickok in 1962, shows that they are tested with exactly the same electrode voltages and have the same full-scale gm. The Triplett 3444A, however, does test these with different parameters. The 7F7 is tested in a region of the curves where the gm is lower than the conditions where 6SL7GT is tested. This is an anomaly and gives beginners the impression that the 7F7 has lower gm. Gm is not a fixed number for any and all conditions. If it were the characteristic curves would in fact be straight lines. In RCA tube manuals you can find nomographs to estimate gm, rp, Ib, etc at voltages/currents other than those listed as the test conditions. Anyone who has ever been out to Leeds knows I love bicycles. An acquaintance has been searching for a new bike and has been asking me for advice. On several occasions he has found something within his price range. But each time he told me he intended to low-ball the seller by as much as 50 percent. The seller’s asking price was in most cases more than reasonable and in some cases very low. His problem is that he has no idea how much something is worth to him. I am convinced if the seller asked $2000, he would offer $1200, but if the seller asked $1200 for the same bicycle, he would not be willing to pay that and would offer $800. It’s a sickness. It’s not enough to get a fair deal. This person needs to take advantage. He’s a member of the “I don’t pay retail” club. What makes the whole thing more annoying is that he works in a service industry and complains bitterly when customers don’t tip him at a level he believes he deserves. A few years ago a man called me and said he needed a replacement meter for his Mercury tube tester. I wasn’t sure I had one but I went in the back and dug for an hour and found not a substitute but the factory meter new and in the original packaging. When I told him the price was $50 he told me that was way too much. The man had a non-functioning tube tester and fifty bucks was going to put it back in service. Wasn’t it worth that much to get it going? If the answer was no, then he really shouldn’t have wasted any of his time looking for the part. He should have simply thrown the thing in the garbage. He’s a member of the “I have no idea what it’s worth to me so it better be cheap” club. Four quarters equals one dollar and one dollar equals four quarters. When you buy something your profit is supposed to be your utility and/or enjoyment from the item. The seller gets a profit that allows him to buy something that gives him utility and/or enjoyment. It’s win-win. Low-ballers don’t play that way. They only way they feel like they have won is if you lose. More recently, a man requested a quote on a part. I wanted the sale and was willing to make considerable adjustment in price because of the quantity. I assumed he was fair so I told him to see what other dealers were offering and that I would be happy to match the lowest price he found. I had not looked myself. 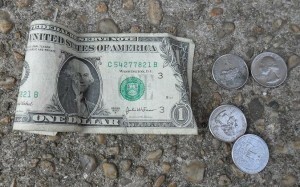 A few days later he came back with a surprisingly low number—around $4. I thought that maybe market volatility had pushed the price down. When I did my own search I found only 7 dealers who actually had the part in stock, and the lowest selling price was more than 3 times higher than what the man told me was the average price. And if he wanted to buy current production from the factory, the cost would be over $100. Some years ago I received a phone call: “Hello. My friend says you’re an expert on setting up moving coil phono cartridges. I have a problem: when playing piano records, during crescendos there is distortion on one channel only.” This was any easy one. Many cartridge manufacturers are optimistic in their minimum tracking force ratings. I told this person that he should start from the beginning and set the tracking force 0.1 to 0.2 grams higher than the minimum, adjusting the anti-skate accordingly. He replied, “No. I think it’s cartridge loading.” Very unlikely. Cartridge loading affects transient and frequency response and to a lesser degree output. I explained that I was quite certain that what I was suggesting would fix the problem and that if it didn’t the cost of trying would be zero. Didn’t your friend say I was an expert? Last week a man appeared at the door. He said he was having a problem with excessive plate current on his Dyna ST-70, a piece of equipment I am so familiar with that I can draw almost the entire schematic from memory. He kept insisting that the “bias” was too high. I told him he had insufficient bias. He replied “But the plate current is too high!” He has confused grid bias (often called bias for short) and the plate/cathode current that bias controls. He’s measuring the voltage across the 15.6 ohm cathode resistor that is brought out to the front-mounted octal test socket. But he hasn’t actually tried it. He hasn’t tried it. And if the bias voltage wasn’t a problem, the bias this morning is exactly what it was a week ago. If he puts the tubes in they will still have excessive plate current. This person simply does not understand that if everything is right with his ST-70 then the tubes he has are not good, and if the tubes are good there is something wrong with his ST-70. High plate current is a serious issue on any amp but particularly on amplifiers with smallish power supplies like ST-70’s. The transformers already run hot and the single GZ-34 rectifier is well stressed; the four EL-34’s alone take 200 ma of the GZ-34’s rated 250 ma. Meaningful. That’s crux of the matter. People who call or stop by and play these games are not looking for meaning or a solution to a problem. They want to engage you. Ensnare you in their world. And it’s a topsy-turvy world. A world where everything is relative, there are no facts and no one knows more than anyone else. It’s also a world where they think I am supposed to have unlimited time to answer their psychological/spiritual/emotional problems disguised as technical queries. I am not supposed to get paid because according to them, my job is too much fun, and fun jobs don’t pay. Please don’t misunderstand. I love giving free technical advice as time permits but my requirement is that conversation is fruitful and enjoyable. I will never forget the first time I saw metal tubes; it was a pair of 6L6’s in a Bogen amplifier from the early 1950’s. 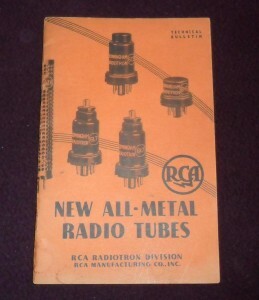 Metal tubes were introduced by RCA in a Technical Bulletin in 1935. 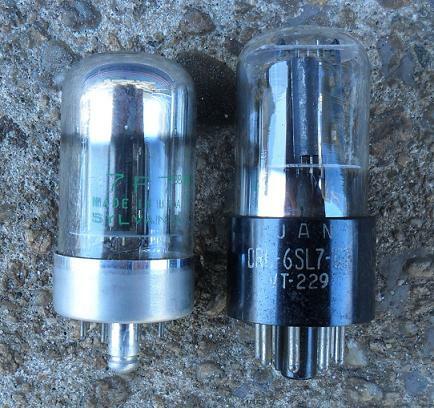 The first metals were: 5Z4 rectifier, 6A8 pentagrid converter, 6C5 triode, 6F5 hi-mu triode, 6F6 power pentode, 6H6 dual diode, 6J7 pentode, 6K7 remote cut-off pentode (called a super control pentode in the bulletin). 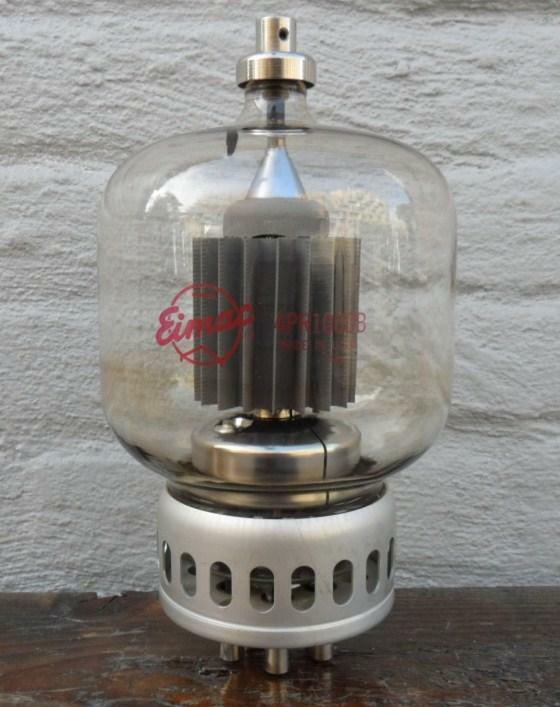 Metal tubes were also the first vacuum tubes to have an octal base. Most people currently building tube gear don’t like using metal tubes. This is strange because they seem to always like older versus newer. It’s almost as if they think metal tubes as lesser just because you can’t see the filament glow. That’s too bad because the earliest metal tubes are superior in construction and quality compared to the older ST enveloped 4, 5, 6 and 7 pin tubes produced earlier. Sorry folks, the mystique of an ST envelope and nostalgia don’t change that. 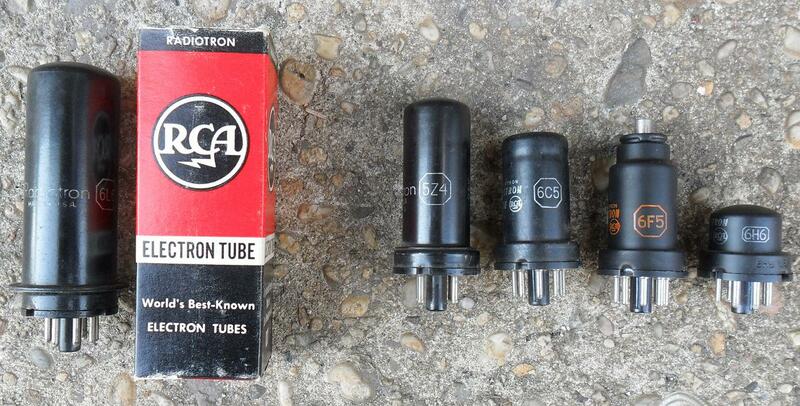 By 1935 tube manufacturers had learned quite a bit. The 6F6 is an interesting tube. Unlike the more common 6V6 the 6F6 is not a beam power tube but an actual pentode. It precedes RCA’s 6L6, the first popular beam power tube, by a year. On the left the history changing 6L6 (not part of the original metal tube offerings) along with 5Z4, 6C5, 6F5, 6H6 tubes. I haven’t tried it, but you can operate 6L6’s upside-down in Ethylene glycol bath at a plate dissipation considerably above the 19 watt maximum called out in the specifications. Do not do attempt this if you have small children, pets, or a fussy spouse at home. Someone ordered an Amphenol 86CP12 plug and backshell a week ago. Amphenol made a whole series of these to mate with tube & connector sockets. They were available as 4 pin, 5 pin, 6 pin, 7 pin, octal, 9 pin, 11 pin, and 12 . The great thing about them were that they all mounted in the same size hole, with the same ring, or on the same backshell. They are simple connectors designed to do their job without you having to think about them. They are also ridiculously easy to solder and assemble. The 9 pin was used as the AC line connector on the $3,000, Collins 51-S1 communications receiver and also on some Hammond Organs. The 11 pin is used as the power connector on the R390A, triple conversion receiver. More than 50,000 390A’s were made for the US government between 1958 and 1984. The first ones cost $1500 and the last $38,000. The 86CP8, octal plug is used on the McIntosh C8 phono preamplifier’s umbilical cord. The 86 series males and their 78 female mates are used on more pieces of equipment than you can count and people still use them today when home building when a simple, relatively rugged connector is needed. Not a week goes by when I don’t sell a least one from the series. Now I really had to find out what unbelievable “high end” equipment he was making! Answer: He’s rebuilding consumer grade Technics reel-to-reel tape decks from the 1970-80’s. So, the 86CP12 is not good enough for a late 1970’s, 240,000 yen (Approx $2,200 back then) but the series is good enough for some of the finest tube communication gear of all time? And what’s he charging for these pieces of “high end”? Nearly $5,000. Clockwise from the left: 4 pin, 5 pin, 6 pin, 7 pin, 8 pin, 9 pin, 11 pin, 12 pin. In the center two style of backshells—with and without strain relief. 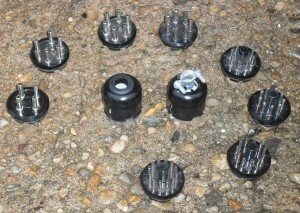 The 8 pin through 12 pin have the same pin circle and pin diameter. To avoid sounding like a noob never refer to anything other than the 8 pin as octal. The nine is NOT a 9 pin octal! This tube is more than 9″ (23 cm) tall. Maximum plate dissipation is 1000 watts. Max plate voltage rating is 30,000 volts. The 4PR1000B is pulse rated version of its cousin the 4-1000A.